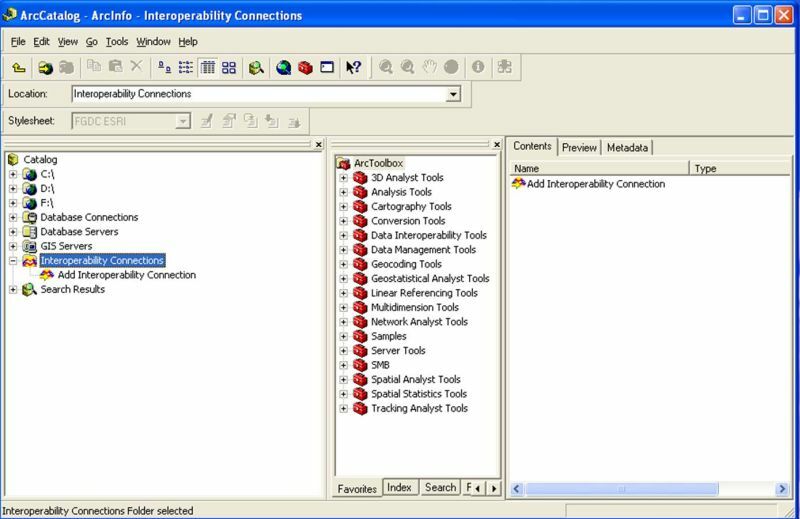 After starting ArcCatalog, click on the "Interoperability Connections" folder, and select "Add Interoperability Connection". See the image below. 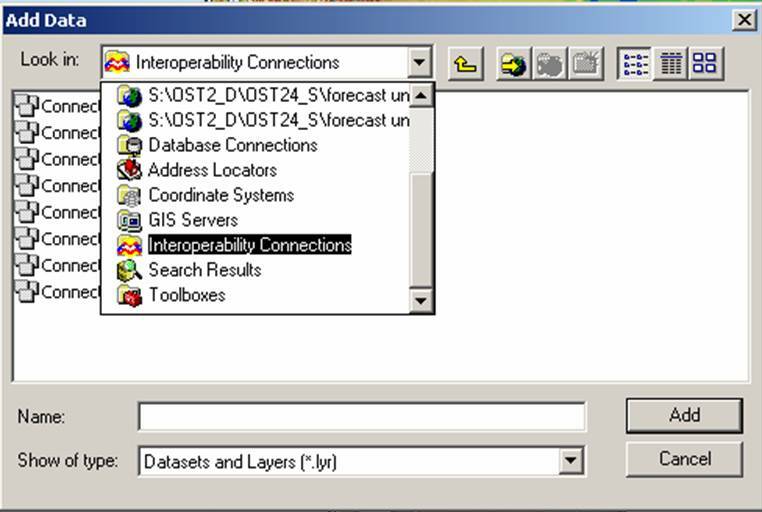 Select "OGC GML v2" from the "Format" pull down menu of the "Interoperability Connection" window. From the "Database" menu, locate and select the file containing the NDFD GML-encoded data. Then click "OK" to dismiss the window See the image below. Now open ArcMap and click on the "Add Data" button. Then ensure the "Interoperability Connections" item is selected from the "Look in" pull down menu. Select the connection that you created in the ArcCatalog. Click the "Add" button to add the connection and dismiss the window. The points retrieved from the service should now be visible on the map. To display the NDFD elements, right click on the connection you just added and select the "Properties" menu item. 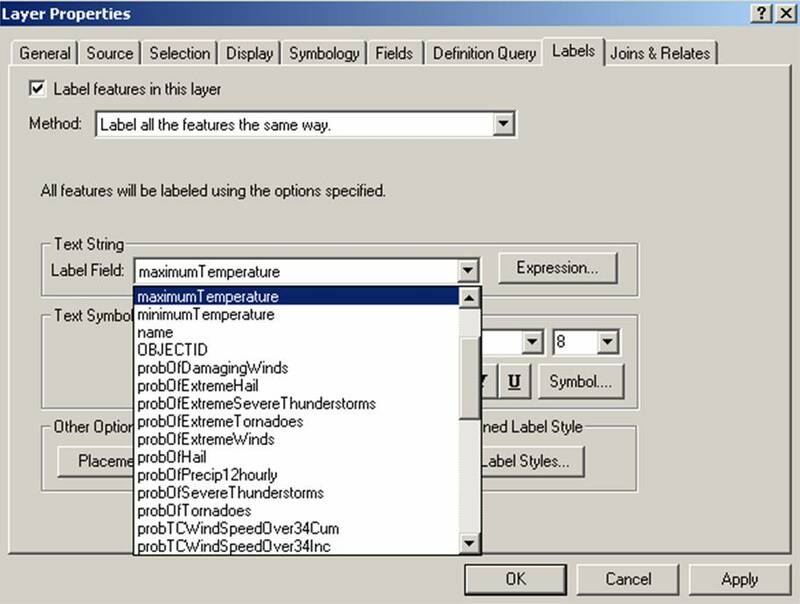 In the "Layer Property" menu, ensure the Label features in this layer check box is selected. Next select the NDFD element you want displayed from the "Label Field" pull down menu. Click the "OK" button and the data for the selected element should appear on the map.